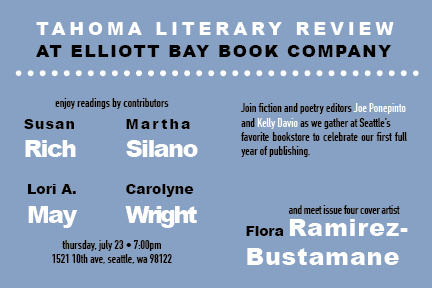 Tahoma Literary Review Reading at Elliott Bay Books July 23, 7:00 p.m.
Tahoma Literary Review, edited by Kelly Davio and Joe Ponepinto, will host a reading at Seattle’s Elliott Bay Book Company on Thursday, July 23, at 7:00 p.m. to celebrate the journal’s one-year anniversary and launch issue #4. Featured readers will include some of my fave Pacific Northwest poets! One of my poems appeared in Issue #2 of Tahoma. Favorite poems in the new issue, #4, include one by Ronda Broatch, whose new collection is out from MoonPath Press; and a stunning 20-part poem, “A Geneology of the Word,” by Nickole Brown. This entry was posted in Uncategorized and tagged culture, language, lit mags, literature, MoonPath Press, Poetry, poetry reading, writing process. Congratulations, Jennifer, and thank you. Sadly, I did not about the Tacoma Literary Review before your post. In Spain, at the moment, or would attend the reading tonight. Adios!